The demand for aesthetic orthodontic treatment is pconstantly growing [1Russell JS. Aesthetic orthodontic brackets. J Orthod 2005; 32(2): 146-63. [http://dx.doi.org/10.1179/146531205225021024] [PMID: 159 94990] ], and this is leading to increased use of ceramic brackets [1Russell JS. Aesthetic orthodontic brackets. J Orthod 2005; 32(2): 146-63. [http://dx.doi.org/10.1179/146531205225021024] [PMID: 159 94990] ], lingual brackets [2Filho HL, Maia LH, Araújo MV, Eliast CN, Ruellas AC. Colour stability of aesthetic brackets: Ceramic and plastic. Aust Orthod J 2013; 29(1): 13-20. [PMID: 23785933] ] and clear aligners [3Waring D, McMullin A, Malik OH. Invisible orthodontics part 3: Aesthetic orthodontic brackets. Dent Update 2013; 40(7): 555-556, 559-561, 563. [http://dx.doi.org/10.12968/denu.2013.40.7.555] [PMID: 2414 7387] ]. The Clear Aligners (CA) are especially suited for aesthetic orthodontic treatment in adult patients [4Miller RJ, Derakhshan M. Three-dimensional technology improves the range of orthodontic treatment with esthetic and removable aligners. World J Orthod 2004; 5(3): 242-9. [PMID: 15612344] ]. This type of treatment is hygienic [5Lin F, Yao L, Bhikoo C, Guo J. Impact of fixed orthodontic appliance or clear-aligner on daily performance, in adult patients with moderate need for treatment. Patient Prefer Adherence 2016; 10: 1639-45. [http://dx.doi.org/10.2147/PPA.S113466] [PMID: 27616881] ], reduces the perception of pain [6Abbate GM, Caria MP, Montanari P, et al. Periodontal health in teenagers treated with removable aligners and fixed orthodontic appliances. J Orofac Orthop 2015; 76(3): 240-50. [http://dx.doi.org/10.1007/s00056-015-0285-5] [PMID: 2592 9710] ] and for this reason, generates more collaboration from the patients [7Allereau B, Sabouni W. Perception of pain in orthodontic treatment with thermoformed aligners. Orthod Fr 2017; 88(4): 383-9. [http://dx.doi.org/10.1051/orthodfr/2017028] [PMID: 29315 072] ]. CA are produced in various materials such as: a new thermoplastic Polyurethane (SmartTrack®) [8Tuncay OC, Bowman SJ, Nicozisis JL, Amy BD. Effectiveness of a compliance indicator for clear aligners. J Clin Orthod 2009; 43(4): 263-8. [PMID: 19458458] ], Polyethylene Terephthalate Glycol-modified (PET-G), Polycarbonate (PC), Thermoplastic Polyurethanes (TPU), Ethylene Vinyl Acetate, Polyethylene Terephthalate (PET), and other materials [9Technology A. Invisalign introduces Smart Track Available at: http:// invisalign.com.au/ doctor/ doc/brochures/ SmartTrack_ brochure.pdf.]. CA are used for orthodontic treatment in many types of malocclusion [10Dupaix RB. B.M., Finite strain behavior of polyetylglycol (PETG). Polymer (Guildf) 2005; 46: 4827-38. 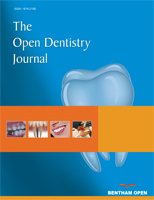 [http://dx.doi.org/10.1016/j.polymer.2005.03.083] -13Dallel I, Bergeyron P, Chok A, Tobji S, Ben Amor A. Intramaxillary devices of molar distalization on fixed appliance and with aligners. Orthod Fr 2017; 88(4): 355-66. [http://dx.doi.org/10.1051/orthodfr/2017030] [PMID: 293150 69] ], with a suggested wear time of 22 hours per day, and a timespan of 15 days for aligners’ change [14Boyd RL, Oh H, Fallah M, Vlaskalic V. An update on present and future considerations of aligners. J Calif Dent Assoc 2006; 34(10): 793-805. [PMID: 17087394] ]. One of the key factors for the clinical success of orthodontic tooth movement with CA is the stability and the retention of the aligners: to increase CA retention, many authors suggest using composite attachments on some teeth [15Miller KB, et al. A comparison of treatment impacts between Invisalign aligner and fixed appliance therapy during the first week of treatment 2007; 131: 302e1-9. [http://dx.doi.org/10.1016/j.ajodo.2006.05.031] , 16Garino F, Castroflorio T, Daher S, et al. Effectiveness of composite attachments in controlling upper-molar movement with aligners. J Clin Orthod 2016; 50(6): 341-7. [PMID: 27475935] ]. Many studies evaluated the clinical effectiveness of CA [17Gomez JP, Peña FM, Martínez V, Giraldo DC, Cardona CI. Initial force systems during bodily tooth movement with plastic aligners and composite attachments: A three-dimensional finite element analysis. Angle Orthod 2015; 85(3): 454-60. [http://dx.doi.org/10.2319/050714-330.1] [PMID: 25181252] -19Ercoli F, Tepedino M, Parziale V, Luzi C. A comparative study of two different clear aligner systems. Prog Orthod 2014; 15(1): 31. [http://dx.doi.org/10.1186/s40510-014-0031-3] [PMID: 24934 094] ], but less information is available from the literature regarding the dimensional modification and stability of CA during the 15 days wear period. The reduction in adaptation precision of the worn CA may reduce the precision in tooth movements. An additional set of patient’s impressions was used to produce a dental cast used for in-vitro testing. Dental casts were poured on a custom-made resin base, designed to be easily secured to the Instron machine (Fig. 1 ). Resin models secured to the Instron machine (color figure). 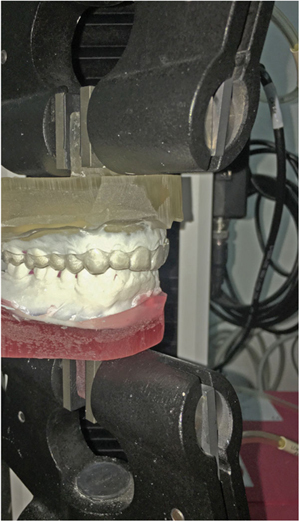 One CA of each material was set on the dental cast, then the casts were settled into occlusion and secured to an Instron 3343 universal testing machine with a loading cell of 1kN. A compressive force of 50N was applied (Fig. 2 ) during a 6 seconds increase, then applied constantly for 15 minutes (Fig. 3 ). The scanned aligners were evaluated with a dedicated software (3 Shape Orthoviewer, 3 Shape, Copenhagen, Denmark). Two points were identified on right and left first molar (posterior area), first premolar (middle area), and canine (anterior area): vestibular apical point of dental crown, defined as “base of the tooth point” (BoT point), and the intersection point of vertical and horizontal axis, defined “facial axis point” (FA point). The authors measured the distance between right and left BoT points on first molar, first premolar, and canine, and the distance between right and left FA points for the same teeth (Fig. 4 ). These measurements were used to compare the dimensional stability of CA after in-vivo dynamic stress and in-vitro static stress within each material, and between different CA materials. 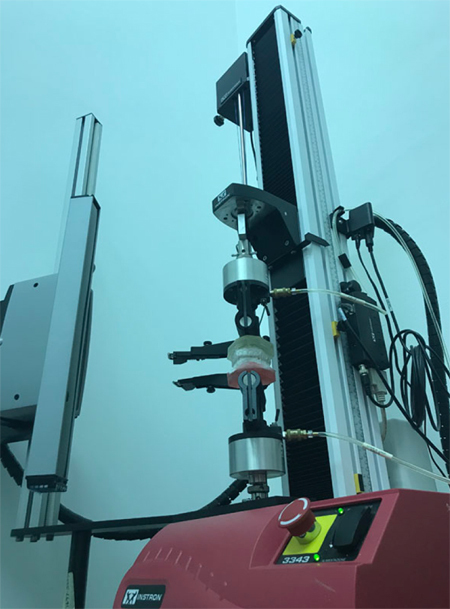 To have a summary value for every material, the distances at the anterior, middle, and posterior parts for both in-vivo and in-vitro tested aligners were pooled and mean and standard deviation were calculated. Instron machine used for static stress (color figure). The differences at the BoT point and at the FA point are shown in Tables 1 and 2. Both Smart track® and PET-G presented at the BoT point the same deformation in dynamic and static stresses. PET had the lowest deformation at the BoT point and at FA point than the PET-G and Smart Track® (Tables 3-5) (Fig. 5 ). The difference was higher in the posterior part than the anterior part. SmartTrack® showed higher deformations than the PET in the static and dynamic test. PET-G had less deformation in the anterior area than the other materials. 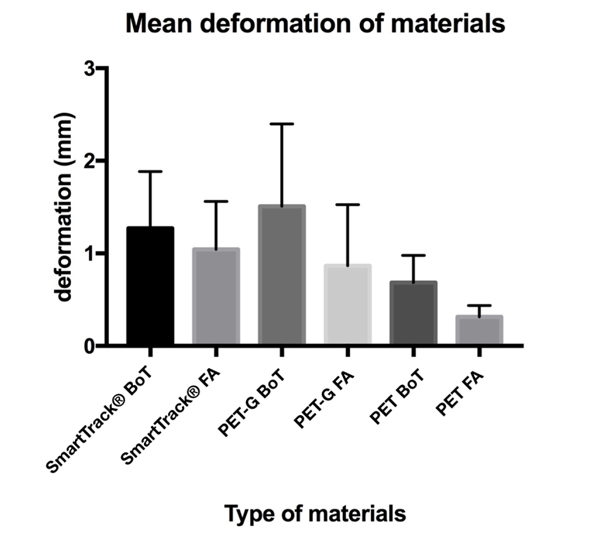 Examining the summary values of each material, in general PET showed the smallest deformation, followed by SmartTrack® and PET-G (Tables 4 and 5). Clear aligners scanned in Ortho Viewer. (color figure). Mean deformation of materials. (black and white figure). Evaluation of BoT point of teeth distance in upper first molar, upper first pre-molar and upper first canine subject a dynamic (patient) and static (instron) stress with different materials. Evaluation of FA point of teeth distance in upper first molar, upper first pre-molar and upper first canine subject a dynamic (patient) and static (instron) stress with different materials. Static and Dynamic evaluation of the differentials obtained on tested materials. Summary values of pooled data for dimensional measurements at BoT point. The first set up dental movement was described by Kesling in 1945 [20Lagravère MO, Flores-Mir C. The treatment effects of Invisalign orthodontic aligners: A systematic review. J Am Dent Assoc 2005; 136(12): 1724-9. [http://dx.doi.org/10.14219/jada.archive.2005.0117] [PMID: 16383 056] ]. The use of occlusal splint in the upper and lower arch with a sequence of aligners induce a tooth movement which solves a malocclusion [21Kesling H. The philosophy of the tooth positioning appliance. Am J Orthod Oral Surg 1945; 31: 297-304. [http://dx.doi.org/10.1016/0096-6347(45)90101-3] ]. The first aligners used were too stiff and thus produced hard forces on teeth; double-layer foils replaced the single-layer foils featuring a highly elastic layer on the inner side of the aligner [22Torres FC, Jóias RP, Cepera F, Paranhos LR, Sanders D. A clinical case treated with clear aligners. Int J Orthod Milwaukee 2011; 22(3): 11-5. [PMID: 22031989] ]. One of the greatest advantages is better oral hygiene during orthodontic treatment for both adults and adolescents [5Lin F, Yao L, Bhikoo C, Guo J. Impact of fixed orthodontic appliance or clear-aligner on daily performance, in adult patients with moderate need for treatment. Patient Prefer Adherence 2016; 10: 1639-45. [http://dx.doi.org/10.2147/PPA.S113466] [PMID: 27616881] ]. On the other hand, the level of patient compliance is the greatest disadvantage [7Allereau B, Sabouni W. Perception of pain in orthodontic treatment with thermoformed aligners. Orthod Fr 2017; 88(4): 383-9. [http://dx.doi.org/10.1051/orthodfr/2017028] [PMID: 29315 072] ]. For this reason, many manufacturers introduced a compliance indicator on aligners [23Fernandez Sanchez J, Pernia Ramirez I, Martin Alonso J. Osamu active retainer for correction of mild relapse. J Clin Orthod 1998; 32(1): 26-8. [PMID: 9709618] ], to evaluate the effective use of the CA. The dental movement may not be adequate for three reasons: the lack of patient’s compliance, the planning of an excessive amount of dental movement, the inadequate transfer of the dental movement from the aligners to the tooth [24Schott TC, Göz G. Color fading of the blue compliance indicator encapsulated in removable clear Invisalign Teen® aligners. Angle Orthod 2011; 81(2): 185-91. [http://dx.doi.org/10.2319/052610-288.1] [PMID: 21208067] ]. Summary values of pooled data for dimensional measurements at FA point. The planning of an excessive amount of dental movement is one of the causes of CA failure. Some manufacturers apply an amount of tooth movement ranging from 0,5 to 1 mm with a single step [25Elkholy F, Mikhaiel B, Schmidt F, Lapatki BG. Mechanical load exerted by PET-G aligners during mesial and distal derotation of a mandibular canine : An in vitro study. J Orofac Orthop 2017; 78(5): 361-70. [http://dx.doi.org/10.1007/s00056-017-0090-4] [PMID: 28357 471] ], while others plan tooth movements of 0.1-0,2 mm with a single aligner [26Kim TW, Echarri P. Clear aligner: An efficient, esthetic, and comfortable option for an adult patient. World J Orthod 2007; 8(1): 13-8. [PMID: 17373221] ]. The use of smaller tooth movement steps is proven to increase the efficacy of the CA treatment and to provide a reduction of the relapse tendency [27Barbagallo LJ, Jones AS, Petocz P, Darendeliler MA. Physical properties of root cementum: Part 10. Comparison of the effects of invisible removable thermoplastic appliances with light and heavy orthodontic forces on premolar cementum. A microcomputed-tomography study. Am J Orthod Dentofacial Orthop 2008; 133(2): 218-27. [http://dx.doi.org/10.1016/j.ajodo.2006.01.043] [PMID: 1824 9288] ]. As many studies have shown, the efficacy of CA treatment depends also on the type of the programmed tooth movements [18Tepedino M, Paoloni V, Cozza P, Chimenti C. Movement of anterior teeth using clear aligners: A three-dimensional, retrospective evaluation. Prog Orthod 2018; 19(1): 9. [http://dx.doi.org/10.1186/s40510-018-0207-3] [PMID: 29607 469] ], since rotations and torquing movements are less predictable than others, although additional mechanics can be used to overcome such limitations of CA, like the use of miniscrews [28Tepedino M, Masedu F, Chimenti C. Comparative evaluation of insertion torque and mechanical stability for self-tapping and self-drilling orthodontic miniscrews: An in vitro study. Head Face Med 2017; 13(1): 10. [http://dx.doi.org/10.1186/s13005-017-0143-3] [PMID: 28558 821] , 29Tepedino M, Cattaneo PM, Masedu F, Chimenti C. Average interradicular sites for miniscrew insertion: Should dental crowding be considered? Dental Press J Orthod 2017; 22(5): 90-7. [http://dx.doi.org/10.1590/2177-6709.22.5.090-097.oar] [PMID: 291 60349] ], elastics, or cantilever mechanics [30Rossini G, Parrini S, Castroflorio T, Deregibus A, Debernardi CL. Efficacy of clear aligners in controlling orthodontic tooth movement: A systematic review. Angle Orthod 2015; 85(5): 881-9. [http://dx.doi.org/10.2319/061614-436.1] [PMID: 25412265] ]. The efficacy of the aligner treatment may be also influenced by the deformation of the CA during the 15 days treatment period. 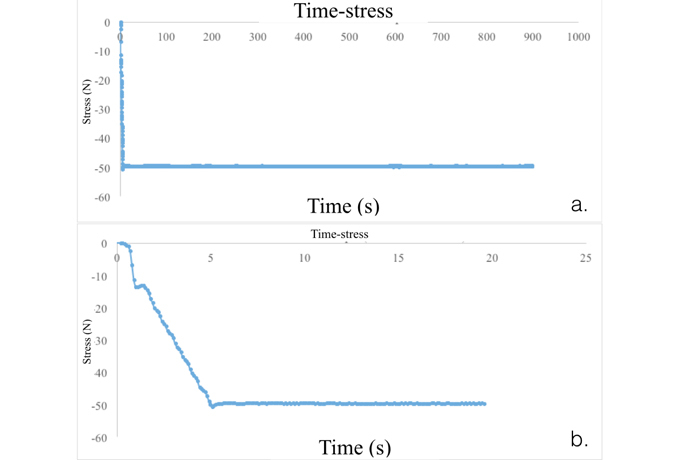 In the present paper, the authors evaluated the CA structure deformation following in-vivo stress (the patient worn the CA for 15 days) and in-vitro static stress with a force of 50 N for 15 minutes. The deformation was evaluated at the posterior part of the CA (i.e. at the first molars of BoT point and FA point), in the middle part (i.e. at the first premolars of BoT point and FA point) and in the anterior part (i.e. at the canine of BoT point and FA point). The best performance evaluated was that of the Polyethylenterephthalat (PET). All materials presented a reduction of deformation passing from the posterior part to the anterior part both at the BoT point and FA point. The mean deformation at the BoT point was of 1.27 mm (SmartTrack®), 1.51 mm (PET-G) and 0.68 mm (PET); at the FA point, the mean deformation was of 1.04 mm (Sma-rtTrack®), 0.87 mm (PET-G) and 0.31 mm (PET). Barbagallo et al., suggest that the deformation of the CA is related to a possible change in the mechanical properties of the aligner foils due to hygroscopic expansion caused by the presence of saliva and the different elastic rebound behavior of the displacement teeth due to their elastic anchorage to the Periodontal Ligament (PDL) [31Barbagallo LJ, Shen G, Jones AS, Swain MV, Petocz P, Darendeliler MA. A novel pressure film approach for determining the force imparted by clear removable thermoplastic appliances. Ann Biomed Eng 2008; 36(2): 335-41. [http://dx.doi.org/10.1007/s10439-007-9424-5] [PMID: 1808 5439] ]. The present experimental setup allowed to isolate the effects of the oral cavity environment (i.e. the oral temperature and the saliva adsorption) from the effects of pure mechanical stress (i.e. the effects of biting force, simulated by an Instron machine). Previous studies tried to simulate the saliva contact with artificial saliva spray [31Barbagallo LJ, Shen G, Jones AS, Swain MV, Petocz P, Darendeliler MA. A novel pressure film approach for determining the force imparted by clear removable thermoplastic appliances. Ann Biomed Eng 2008; 36(2): 335-41. [http://dx.doi.org/10.1007/s10439-007-9424-5] [PMID: 1808 5439] -34Ryokawa H, Miyazaki Y, Fujishima A, Takashi M, Koutaro M. The mechanical properties of dental thermoplastic materials in a simulated intraoral environment. Orthod Waves 2006; 65: 64-72. [http://dx.doi.org/10.1016/j.odw.2006.03.003] ]. Ryokawa et al measured the changes in thickness of the thermoplastic materials with thermoforming and water adsorption. The range of modification after thermoforming and water absorption was: thickness change from 74.9% to 92.6%, linear expansion from 100.3% to 119.9% [34Ryokawa H, Miyazaki Y, Fujishima A, Takashi M, Koutaro M. The mechanical properties of dental thermoplastic materials in a simulated intraoral environment. Orthod Waves 2006; 65: 64-72. [http://dx.doi.org/10.1016/j.odw.2006.03.003] ].